Oakshade Raceway officially kicked off the 2012 racing season with a 200-Lap Enduro race on Sunday afternoon after the Bill Reckner Memorial season opener was cancelled due to inclement weather the night before. Shawn Stamm from Archbold, Ohio marched out to the early lead and maintained the point for most of the first 100 laps. Kelsey Stamm overtook him for the lead by the halfway point of the race as Shawn began to fade. Kelsey led the next 80 laps or so with Rob Liaeff and Mark Henderson not far behind. With less than 25 laps remaining, Kelsey Stamm’s car began to smoke and slowly lost power. That allowed Liaeff to take the lead with about 10 laps to go. A brief stop in the pits for Kelsey Stamm near the conclusion of the race allowed Mark Henderson to take second. Rob Liaeff out of Holland, Ohio held off Henderson to take the first checkered flag of the season. Kelsy Stamm limped to a third place finish followed by Ron Bloomfield, Jr. from Luckey, Ohio and Wauseon, Ohio’s Devin Goodman. 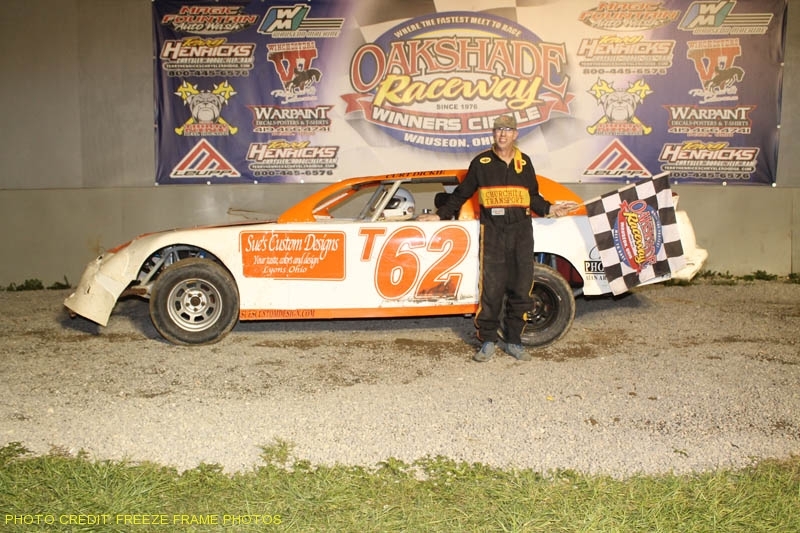 Saturday night racing action returns to Oakshade Raceway on May 5, with a full show of UMP Late Models, UMP Sportsmen, UMP Bombers, Hornets and the debut of the new UMP Sport Compact class. Gates open at 4pm with racing at 7pm.